What is “Succeed Inside The Box”? Succeed Inside The Box was created and headlined by nationally known author, consultant and keynote speaker Dr. Rick Grandinetti who has been reforming company culture before it was even the thing to do. 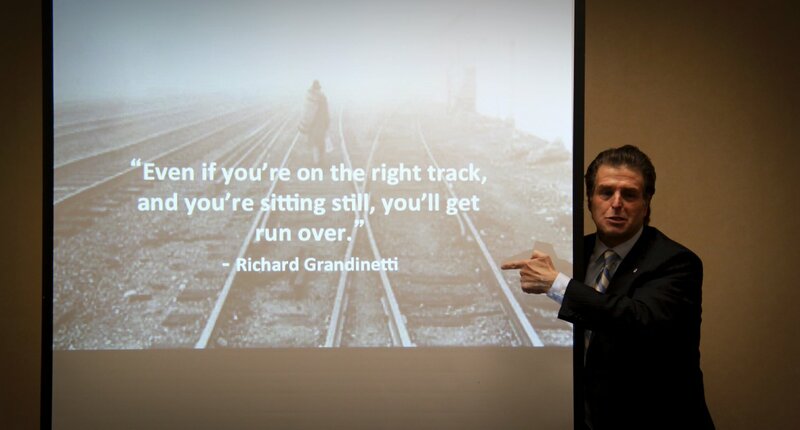 Dr. Grandinetti will not only figure out what is broken in your organization or leading to its possible demise, he will fix it and make sure it continues to prosper in the right way. People have been saying for ages to “think outside of the box” and it does not work. People need to get back to the basics and practice "good old" customer service, for that reason Succeed Inside The Box was born. Through seminars with Dr. Grandinetti, you can expect members of your organization to learn about business without picking up a textbook. You will be so enticed that you won’t even realize that you are learning and the time will fly by leaving you wanting more. Even if you are on the fast track to nowhere, Succeed Inside The Box will stop your organization's downward spiral and help you realize that success is possible in these hard times. There is a light at the end of the tunnel and that light is not shutting the doors to your organization.